The "Basket of Fire" pepper bred especially for hanging baskets is an edible ornamental pepper. It will thrive even in extreme heat and low humidity. With a mature height of 12 inches this little plant will spread with cascading branches to 20 inches wide. This pepper is not shy and will produce hundreds of peppers per plant! With a tolerance for cooler temperatures and the beautiful warm colors, "Basket of Fire" is a great addition to your fall garden. 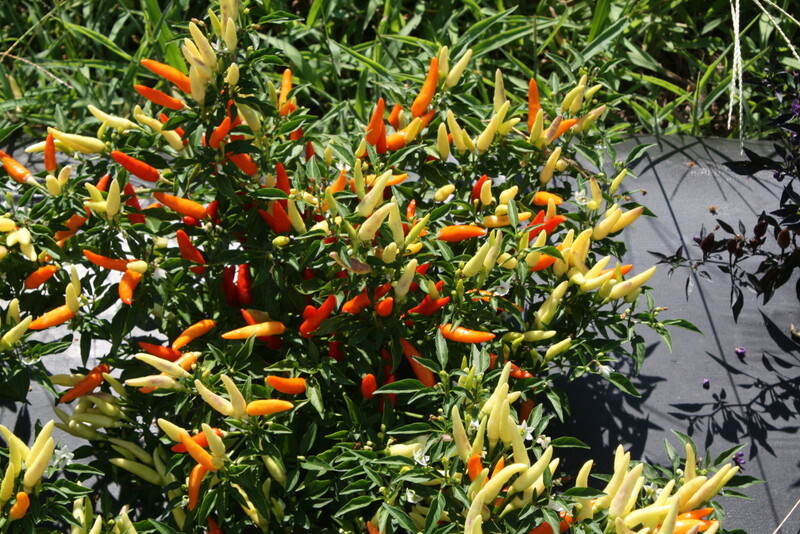 Special notes: Basket of Fire Pepper is hardy to USDA hardiness zones 11 - 12. The flowers are small, white and star-shaped. This prolific little pepper is grown mainly for its extremely showy fruits which are edible. The fruit will start out creamy in color. As the fruit matures it will deepen to yellow then orange and finish with a bright red. At any given time all colors can be present on the plant. The fruits are relatively small 1 - 2 inches with a Scoville heat rating of approx. 80000shu. Fruit set is normally in 90 days.